The Sistine Chapel is the building in which a papal election takes place. Since popes are usually appointed for life, an election of the pope is not frequent. Thus, the Sistine Chapel is almost always available to visitors to the Vatican Museum. It is the highlight of the visit of the huge museum. 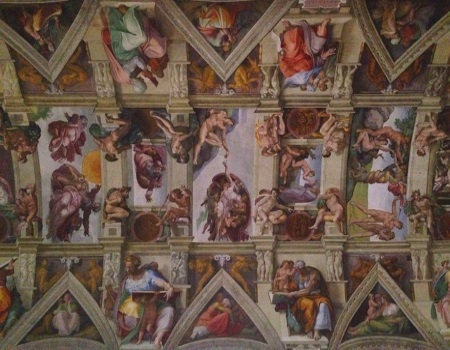 Michelangelo’s paintings on the walls and ceiling of the chapel are among the most important works of art in the world. Many signposts in the Vatican Museum lead visitors to the Sistine Chapel. It goes through many rooms in the exhibition and some stairs up and down. After a long walk you suddenly find a door on the right and behind it a beautiful hall with colourful pictures on the wall. The first impression is stunning. Only after a few seconds did we understand that we are now in the Sistine Chapel. The Cappella Sistina (Italian name) is the most famous part of the Vatican Museums. There is always a lot going on. But we were lucky to get one of the few seats along the walls after a few minutes on a Monday morning in November. As the really big works of art are on the ceiling, you see much better when sitting. In the Vatican Museum, you can theoretically buy an entrance ticket at the box office, but you usually have to queue for hours. Often, the queue along the wall around the Vatican is several hundred metres long, often even one kilometre and more. Many museum visitors now have tickets with preferential admission. These are available in advance on the Internet. A combination ticket for the Vatican with a museum and St. Peter’s Cathedral is also very popular. St. Peter’s Basilica is theoretically free, but there are very long queues. We even waited 2 hours in December. The highlight is the ceiling with scenes from the Bible. Especially the nine pictures in the middle row are among the top 10 works of art in the world. For many experts, the fresco by Michelangelo is even the top work of art of all time alongside the Mona Lisa by Leonardo da Vinci. The famous ceiling painting by Michelangelo in the Sistine Chapel has a total size of gigantic 520 m². It shows only scenes from the First Book of Moses (Genesis). The painting on the ceiling was made by Michelangelo between 1508 and 1512. The absolute highlight is the middle painting „The Creation of Adam“.. The picture shows Adam (left) stretching out his hand to touch God (right). The spark of life should jump over to Adam. It is probably the most famous fresco in the history of art. All pictures in this series by Michelangelo depict scenes from the Old Testament. But other pictures on the walls are also regarded as outstanding works of art. Some, such as „The Last Judgement“ behind the altar are also by Michelangelo, others by other artists. These include Botticelli, Perugino, Rosselli and Signorelli. Size: The building is about 40 meters long and about 13 meters wide. It is therefore more of a medium-sized church than a chapel. The Sistine Chapel is connected to the largest church in the world next to St. Peter’s Basilica and by a staircase called Scala Regina. However, visitors cannot enter this corridor. Julius II was the great Pope, who commissioned Michelangelo to paint the pictures. He did not want to paint at first. He said that he was more of a sculptor. Due to the great importance of the commission, Michelangelo agreed. The other outstanding work of art in the Vatican Museum, Raphael’s punches, was produced practically simultaneously. Michelangelo and Raphael (Raffaello) often worked on their masterpieces on the same day. Through the four rooms of the stanzas, you arrive at the big tour through the Vatican Museum shortly before the Sistine Chapel. The Sistine Chapel is very well signposted in the Vatican Museum at the back. When visiting the museum shortly after its opening in the morning, we recommend to first go to the Sistine Chapel and see the things on the way there in a second tour. Then there is not much going on in the chapel and you have better chances to get a seat. In the Sistine Chapel the election of the Pope (Conclave) takes place. All the cardinals of the world meet here and remain in the building until a new Pope is appointed. This can take several days, some centuries ago often weeks or even months. A papal election is rare, since the popes are usually elected for life. Exception was the last Pope Benedict XVI (14. ), who renounced his office during his lifetime. The name Sistine Chapel goes back to Pope Sixtus IV (in office from 1471 to 1484), who commissioned the building. It is part of the Apostolic Palace, which also includes the Pope’s apartments and offices. The modest current Pope Francis, however, lives in an apartment in the Vatican’s guest house. Michelangelo was actually a sculptor. It is all the more astonishing how he was able to create such a magnificent fresco. He also made the most important sculpture of all time, David. In the Vatican Museum, you can theoretically buy an entrance ticket at the box office, but you usually has to queue for hours. Often, the queue along the wall around the Vatican is several hundred metres long, often even one kilometre and more. Many museum visitors now have tickets with preferential admission. These are available in advance on the Internet.